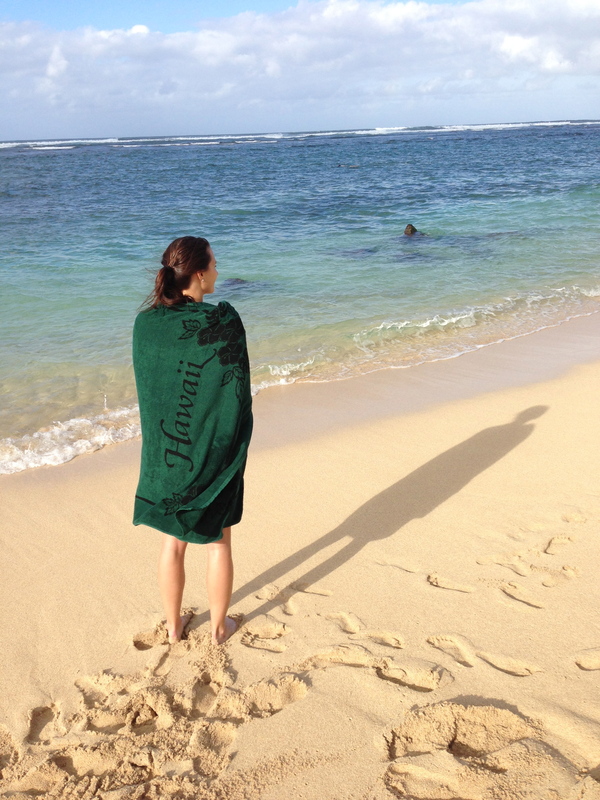 Last night Daniel and I made our second University of Hawaii sporting event. The first was the UH-Army football game last year, but that hardly counts since we were rooting against Rainbow Warriors. 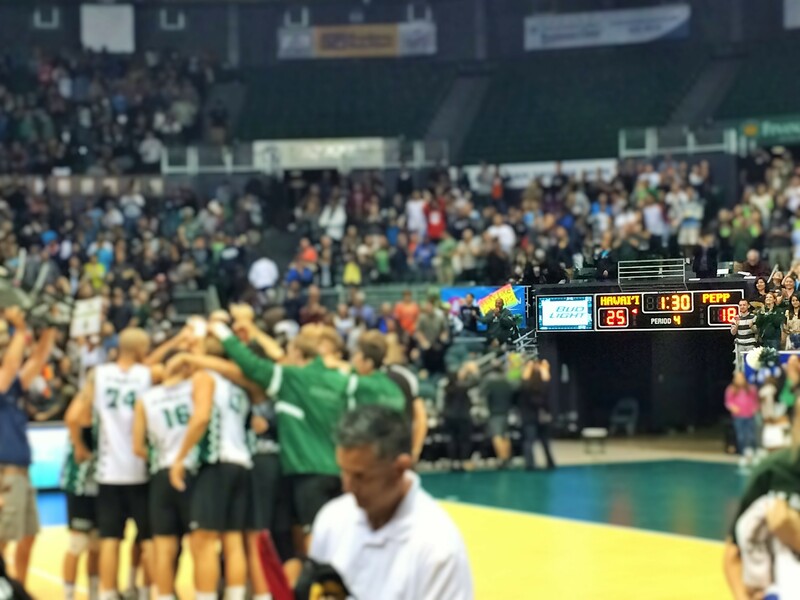 Last night, however, we were in full support of the Hawaii men’s volleyball team. 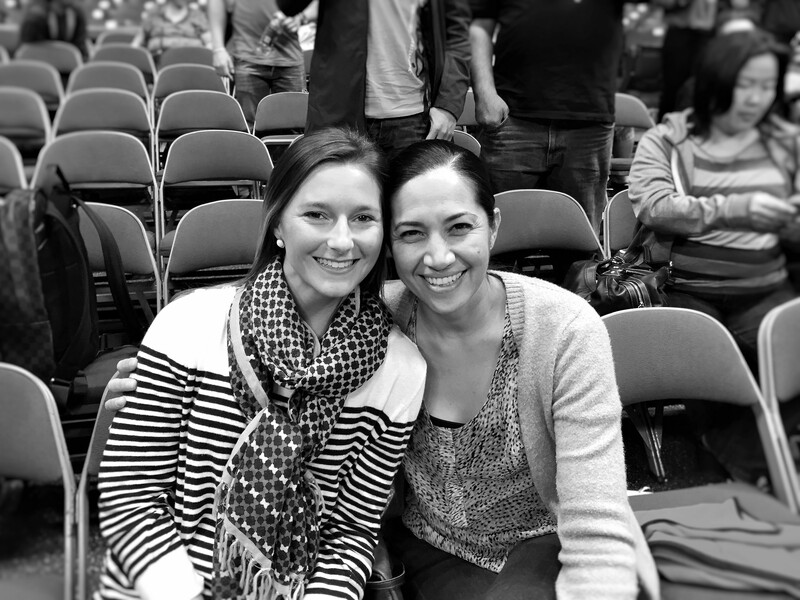 We were invited to the game by my friend Tani, who’s husband just so happens to be the coach. How cool is that!? Tani and me cheering on UH! What’s even more awesome is that since we were her guests, we got to sit in the very first row on the team-side of the court. Cha-ching! There are few things I love more than the sport of volleyball. It’s weird to think that it’s been over eight years since I’ve played anything other than jungle-ball on some co-ed leagues, and it’s been 3 years since I’ve even done that! Attending the game last night made me SO happy and even more nostalgic. Daniel, on the other hand, was a volleyball virgin. Not only has he never seen me play, he’s never seen anyone play! He definitely wouldn’t have gotten to wear my jersey in high school :). Where high school plays best out of three, college is best out of five. The each game of the match is played to twenty-five points, but you must win by two. If it comes down to a tie-breaker, the last game is only played to fifteen, still win by two. Evenly matched teams like UH and Pepperdine make the game intensely exciting. UH was technically the underdog last night, but with a large home crowd they played with confidence and finesse. Wound up winning in just four games. Wa-hoo! [Insert smooth transition – sorry] Since the game landed on a Friday night during Lent, we needed to avoid having a meaty dinner. Instead, we stopped over at an awesome sushi place called Sushi King. 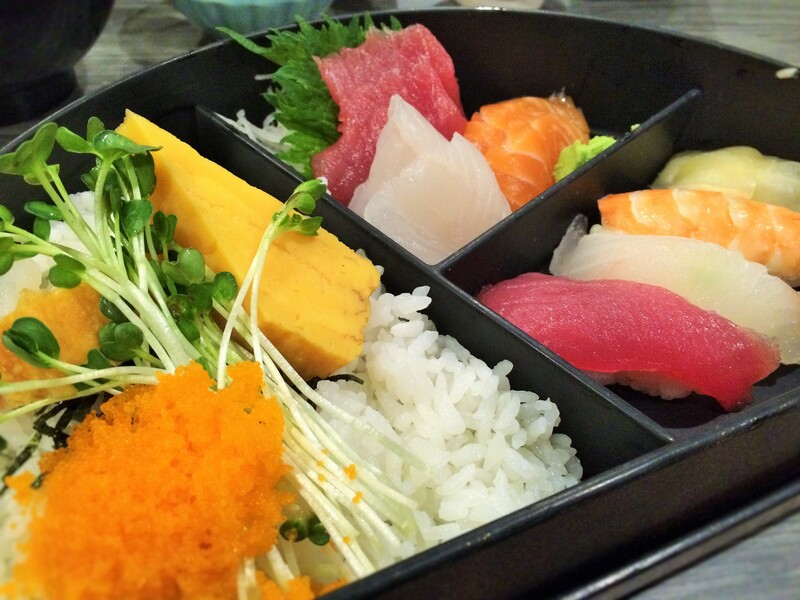 It was Tani, again, who first introduced me to Sushi King a few weeks ago for lunch. It’s just around the corner from the UH athletic complex, so it was an easy choice for a pre-game feast. I mean look at those colors! 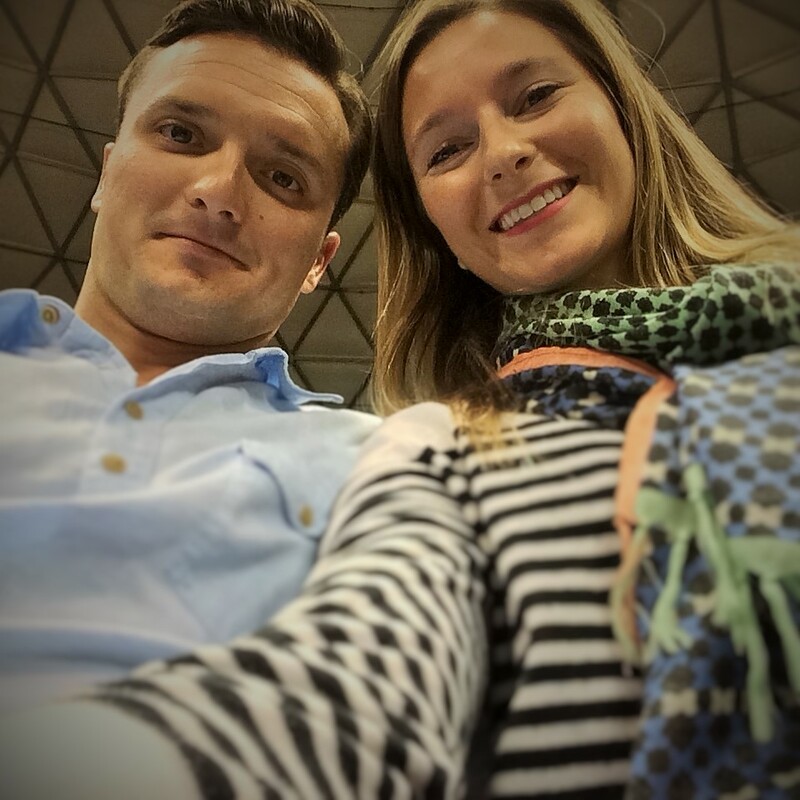 Sushi AND volleyball in the same night … I’m a lucky girl! 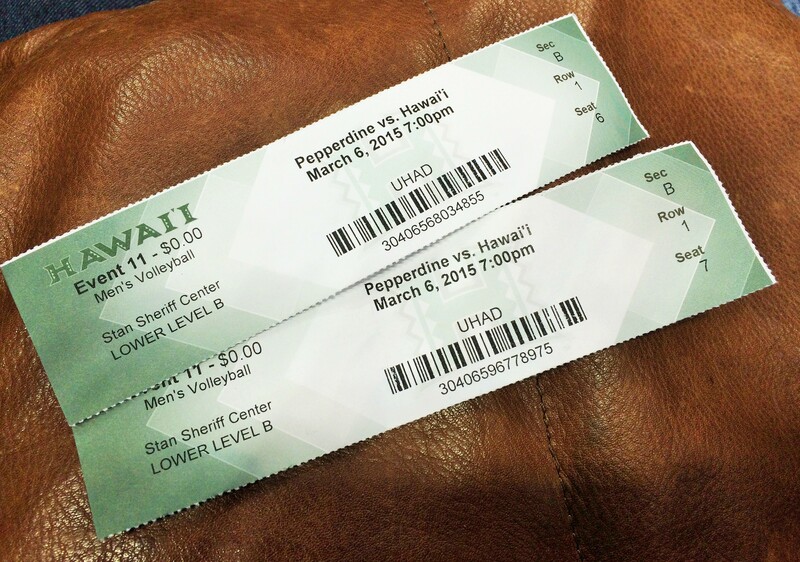 Tags: Men's Volleyball, University of Hawaii, Volleyball. Bookmark the permalink. OMG! Daniel has never seen a volleyball game before!! Gosh, I am glad you came out to one of most exciting matches this season! Ok let me rephrase my “pillow fight” remark. Let’s just say most guys hit the ball harder. Thanks for coming out to cheer the UH Warriors on! You’re pillow fight remark was perfect! I loved it. And yes, it’s amazing that Daniel and I were even compatible after I found out his lack volleyball experience.